As if anyone really needs convincing these days that they should change from using original brand inkjet cartridges to compatible or remanufactured, here are 15 reasons as to why it makes sense to make the switch. Compatible inkjet cartridges are manufactured by third party manufactures and can be up to 70% cheaper than original brand cartridges. 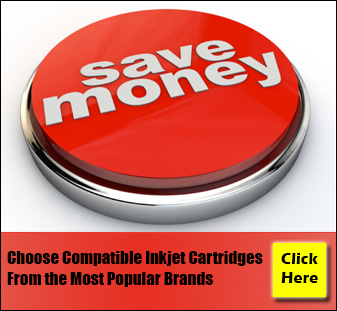 Remanufactured inkjet cartridges are original brand cartridges that have been refilled and tested. These cartridges have been reused instead of going to landfill and are therefore environmentally friendly. Big savings to be made by families with more than one user of the printer or in fact more than one printer. This can save a busy family up to €300 on their ink bill in a year. Volume content levels are much higher than the original brand inkjets. For example the Epson T1281 original brand cartridge has a volume content of 5.9ml and the compatible version has a volume content of 15ml. This is over 150% more ink than the original! Reliability comes as standard as good quality compatible inkjet cartridges are tested to the same ISO standards as the original brand cartridges. The high quality cartridges are exposed to rigorous testing. The quality of the print outs from the compatible ink cartridges compares well to the original brand with no noticeable difference when printing text. Problems with cartridges recognition can usually be overcome by following a simple set of instructions. Depending on the brand of inkjet cartridge, simply removing and reinstalling the cartridge can be enough to trigger the acceptance of the cartridge. Help and advicefrom your supplier will usually be on hand to resolve any issues. All compatible and remanufactured inkjet cartridges are generally tested before they leave the factory to ensure a high performance of the cartridge. Great online deals are usually only associated with compatible inkjet cartridges and not with the original brand products. These include free ink cartridges and you will find promotional offers are run almost all year round. The reason for this is that the profit margin on the compatible ink and toner will allow more movement on the selling price. All the top brands of inkjet cartridges including HP, Epson, Lexmark, Kodak, Brother, Dell and Canon are available as compatibles. Compatible cartridges serving the latest models of some brands may take a little longer to reach the market but the latest original brand cartridges are continually being developed by third party manufacturers. It’s inaccurate that all compatible cartridges will cause physical damage to a printer. There are plenty of good quality compatible cartridges on the market that will work perfectly well in any brand of printer. Compatible ink cartridges are widely available online although not so much on the high street, these reason for this is that the high street prices will not be as competitive as those of the online shops. The online compatible inkjet cartridge suppliers reward customer loyalty with many offering low cost next day delivery and money back guarantees. Many brand new printers will accept compatible cartridges once they have had the cycle of accepting the original brand once, this means you can start saving money from the moment you buy your first compatible inkjet cartridge.